What a post by wirral - confirming the name change, already posted! As reported by Blue Scrumpy this pub is now called the Head of Steam. 5 or 6 ales and 1 cider available today. I had an IPA (can't remember the name). It was a well kept ale. Definitely worth a visit. The Abbey has now closed and the place has been refurbished and re-opened as a Head Of Steam, run by Cameron's Brewery. The bar has been moved to a central position and this place is much improved. 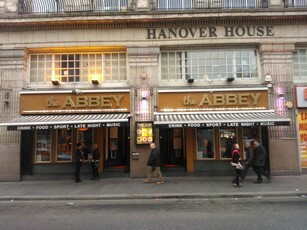 The Abbey was a place that I might pass and wonder in to see what was on, but seldom have a drink there. The Head Of Steam is more of a destination pub that is worthy of a visit in its own right. I've been here 3 or 4 times now. I've been when it has been quiet and I've been when it has been packed. Food is served. Live football is shown on the TV. Service is by knowledgeable staff and they offer a CAMRA discount. But it can take a while when they are busy. Ales on my December 2nd visit were Brew York Little Eagle, Cameron's Strongarm, Road Crew & Cola Bottle Stout, Leeds Pale, Exit 22 Golden Cascade, Chapter Parabola & Neptune Black Percula Chocolate Orange Stout. The real cider was Orchard Pig The Hogfather. Great new pub. Despite the ale quality being good it's more than passing resemblance to one of the chain drinking barns isn't conducive to having that second pint. Does a few ales all in good nick and all at decent prices (between 2.50-2.80), it also says you can get a loyalty card of some sort that gets you 10 p off each pint. A few of the Lancaster brewery beers when I was in all quite nice. It's not somewhere I'd hang around but it's good if you're in a group or may be if you wanted to have a quiet pint and sit by the window and watch the happenings of Liverpool.